The Mistral Mare Hotel is located on a hillside in the Cretan village of Kalo Chorio, just 500m from a fine sandy beach. 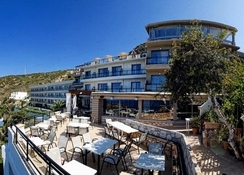 The hotel offers excellent views of the Mirabello gulf. Facilities and services offered at the hotel include a 24-hour reception, lobby area with a swanky bar, restaurants, outdoor pools, sun terraces with a pool side bars and gardens. 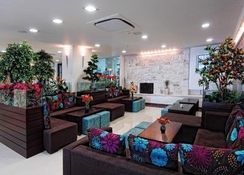 The hotel also features a business centre, wireless internet access and internet corner (both with extra charge), table tennis, billiards, mini market, souvenir shop and mini spa with gym room, sauna and massage service. The onsite restaurant serves both local and international cuisines with a varied list of specialities. There are two poolside bars adjacent to both the pools. There’s also a lobby bar that stocks the best spirits and wines. Perched on the side of a hill in lovely Kalo Chorio, the Mistral Mare Hotel is only 500m from the Istro Beach. The town centre is about 3km from the hotel and can be reached in 20 minutes on foot. However, the hotel being situated on a hillside, it is advised to rent a bike or car for your local commute. The famous Golden Beach of Crete is about 45km from the property. The Heraklion international airport is 82km from the hotel. The Mistral Mare Hotel features 100 guestrooms that are categorised as standard rooms, standard rooms with sea view, superior rooms with sea view, superior golden wing rooms with sea view. Amenities in the rooms include: air conditioning, private bathroom with bath or shower, hairdryer, private balcony or terrace, direct dial telephone, satellite TV, mini fridge and safety deposit box. Some amenities are payable locally. 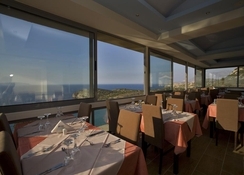 The Sophia restaurant at Mistral Mare Hotel serves excellent Greek and international cuisines. Vegetarians and vegans too can enjoy the meals here; however prior intimation is advised. The two pool bars make sure your hunger pangs between meals are taken care of. The lobby bar stocks the best wines and spirits, and is the best place to unwind after a long day at the beach. 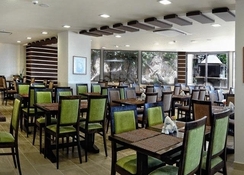 There are a handful restaurants and bars close to the hotel, which serve authentic Greek and Cretan cuisine. Two swimming pools, three bars, a state of the art gym, a mini spa, a billiards room, a souvenir shop and a mini market make up for the facilities at the Mistral Mare Hotel. The hotel also features a table tennis rooms, an internet corner, a luggage room and a parking area. Guests can sweat out the toxins at the hotel’s sauna, which is built and shaped in traditional Greek fashion. 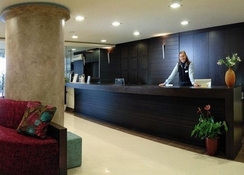 The hotel staff can arrange for excursions as well as car and bike rentals. Free private parking is possible on site(reservation is not needed).